Most people fantasize about supermodels (at least most guys, I have no clue about females). But I’m different. I dream about a world with limited government, sort of like what America’s Founding Fathers had in mind. One of the best things about this fantasy world is that we would not need an income tax. Indeed, with the exception of brief periods during the Civil War and 1894-1895, America did just fine without an income tax all the way ’til 1913. But even though I like the idea of a society where none of us is burdened by an income tax, it does not automatically follow that I’m happy about the growing number of people that are now exempted from the tax. My concern revolves around the fact that if government is “free” for a growing number of people, that may lead them to support policies that make government even bigger. More generally, this could be another step toward becoming a failed state like Greece, with too many people riding in the wagon and not enough people pulling the wagon. 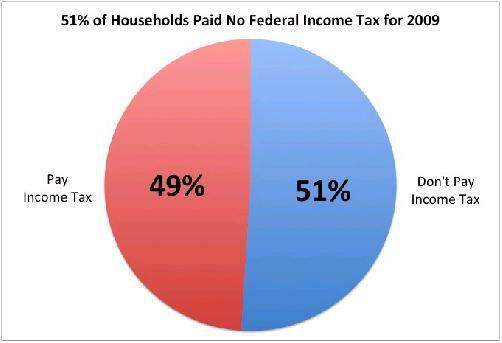 Here’s a chart, showing the most-recent breakdown of taxpayers vs. non-taxpayers, from the Ways & Means Committee. Since I’m one of those “reality-challenged” people who prefer smaller government, I obviously disagreed with his analysis. But his reference to Hoover set off alarm bells. As I have noted before, Hoover increased the burden of government during his time in office. But maybe my memory was wrong. So I went to the Historical Tables of the Budget and looked up the annual spending data. 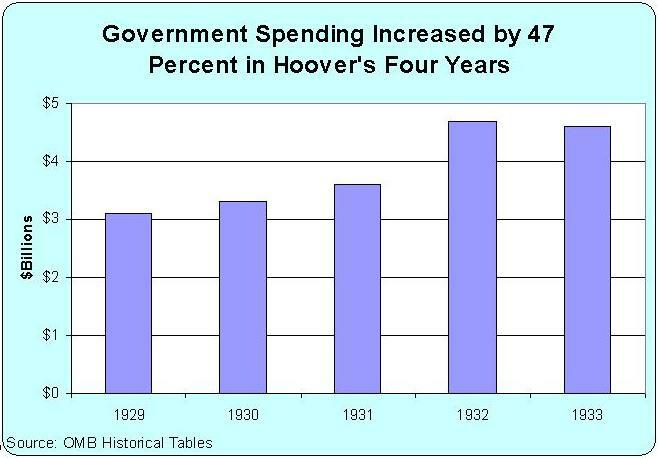 As you can see from the chart, it turns out that Hoover increased government spending by 47 percent in just four years (if you adjust for falling prices, as Russ Roberts did at Cafe Hayek, it turns out that Hoover increased government spending by more than 50 percent). I suppose I could make my own snarky comment about being “reality-challenged,” but Sullivan’s mistake is understandable. The historical analysis and understanding of the Great Depression is woefully inadequate, and millions of people genuinely believe that Hoover was an early version of Ronald Reagan. I will say, however, that I agree with Sullivan’s conclusion. He closed by saying it would be “bonkers” to replicate Hoover’s policies today. I might have picked a different word, but I fully subscribe to the notion that making government bigger was a mistake then, and it’s a mistake now.